PhD in Engineering Design, IIT Madras- Pass out in 2014. M.E in Applied Electronics from Thanthai Periyar Goverment Institute of Technology, Vellore- Pass out in 2007- First Class with Distinction. B.E in Electronics and Communication Engineering from Bhajarang Engineering College, Chennai- Pass out in 2005- First Class with Distinction. 2. 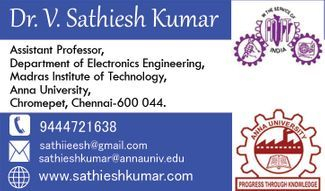 Lecturer in Saveetha Engineering College, Thandalam from Dec 2008- May 2010. 1. Lecturer in Vel Multitech, Avadi from Dec 2007- Nov 2008. Date of Birth: 23rd June 1984. Hobbies: Reading Books, Cycling and Listening to Music.